> the Nile Delta and formed their own kingdom. 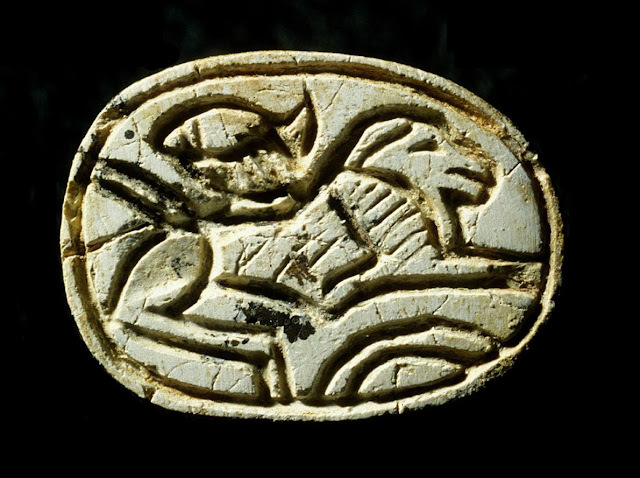 The Egyptian scarab found on the chest of the young girl depicts a crouching lion and the sun rising over a hill. "The child was adorned with jewelry, including two stone scarabs – one which contained hieroglyphics that may have included the name of the city’s ruler." The powder found in the mother of pearl shells likely came from mines known to have been used by the ancient Egyptians, according to National Geographic. This indicates the city had important connections long before its destruction.